My spruce shoot liqueur is ready to be tasted! I started making it in May so it’s about time now. This golden liqueur consists of spruce shoot shot that is sweetened with spruce shoot syrup. These two main ingredients are prepared in spring but the result can be enjoyed half a year later. Spruce shoot liqueur and spruce shoot syrup are powerful remedies against cough. After bottling the big batch into smaller Christmas gift sized bottles I’ll save the rest for a possible winter time cold. Prepare the spruce shoot shot by filling a glass jar with spruce shoots and pouring vodka (max. 35%) on top until the jar is full. Let the mixture rest in room temperature for three weeks and remove the shoots after that. Pour in stronger (80%) vodka until you estimate that the percentage of the mixture would be close to 40%. The flavor still needs to settle so leave the shot alone for two months or so. The spruce shoot liqueur is made by mixing spruce shoot syrup and spruce shoot shot together.The ratio is approximately 1/3 spruce shoot syrup and 2/3 spruce shoot shot. Taste the liqueur to determine how much sugar you want to have in it. Just focus on the sugar content and don’t mind the flavor yet, it’ll change a lot during the next one and half months that the liqueur needs to settle. For my 750ml bottle I used 5dl shot and 2,5dl syrup. (Optional) Bottle the liqueur in smaller bottles. 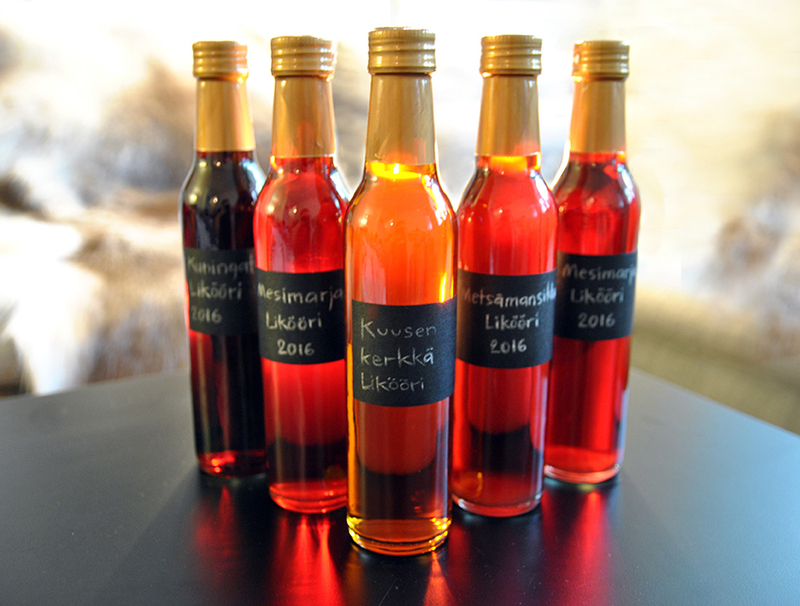 There will be some cloudy-looking liqueur on the bottom of your original container – for a golden result (as in the picture above) , make sure that you don’t mix that in with the clear liqueur. The cloudy liqueur is just as good to enjoy though and you can save it for yourself for later.